Youtube is the most popular platform in the world on the web which is connecting the audience and the new talented artists at one platform. Youtube is the biggest network of channels where artists have a great chance to grab the opportunities and unlock their future. 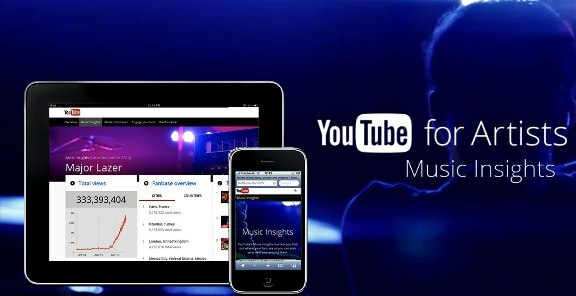 Very soon, Youtube is going to announce a brand new analytical tool for the artists to know their popularity in different regions with “Youtube music Insights”. The Insight tool is very much advantageous to the independent artists who are going with the individual self videos on the Youtube platform as well as for all other musicians and artists across the Globe. The Youtube tools for artists analyze and produce a clear statement on number of views in total up to 10,000 from various regions. So that the artists can know about their present status and their performs and fans according to the region. It is available in 22 different languages and is very helpful to improve the performance and as well as to drive the right and better views from the targeted places. The data can be claimed from the website content via content ID. It is very beneficial for the artists to know about their fan base at a particular region across the globe. They can also know about their performance graph by using the Youtube analytical tool online.